Steven Hill explodes the myths about Social Security and shows how to strengthen it. His book is Expand Social Security Now! : How to Ensure Americans Get the Retirement They Deserve (Beacon Press, 2016)(Beacon Press, 2016). Then, the election is next week. But is every vote equal? We talk with Beverly Harris of Black Box Voting about new research she’s published claiming voting machines are counting some votes as worth more than others. Historian Tracy Campbell discusses the history of election fraud in America. 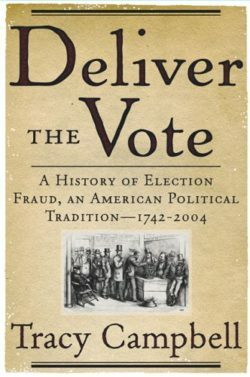 He is the author of the acclaimed book, Deliver the Vote: A History of Election Fraud, an American Political Tradition, 1742-2004 (Basic Books, 2005). WV spoke to him at length about this history — and his concerns that Trump’s claims muddy the waters. Campbell is Professor of History at the University of Kentucky.